Where the Wild Things Are has been one of the most cherished children’s books for decades and is a personal favorite of mine from my own childhood. It’s an imaginative tale of rebellion and escaping the mundane world for one of your wildest dreams. From the early production stills and trailer it was clear that this was going to be a beautiful adventure-filled movie. I had high expectations going in, but the film actually ended up beating those expectations to give me a truly exhilarating and blissful cinema experience. Few picture books turned in to movies draw you in so deeply and continue to be so fascinating throughout as Where the Wild Things Are does. In fact, most have such little material to draw from that the novelty in the idea is better than the actual film. 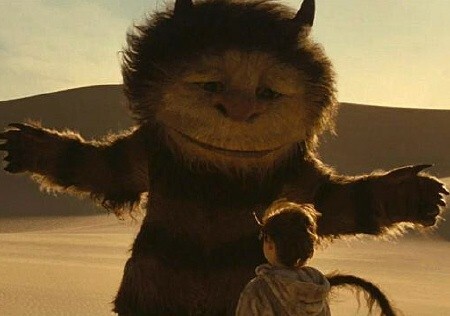 Where the Wild Things Are actually expands on the original material while still representing the original story with such a youthful and true approach. Max (Records) is a lonely young boy, full of energy with a vibrant imagination, but no one to share it with or really appreciate it. His sister, Claire (Emmerichs), is more preoccupied with her friends. He has a very caring mother (Keener), but she is often busy with her job and spending time with her boyfriend (Mark Ruffalo). One day, Max gets fed up of having no one to play with and puts on a wolf costume before dinner. He acts out towards his mother to get attention. When they get in a fight he runs off. He runs and runs, sails through the sea, coming to a lengthy desert in to an outlandish forest. Max glimpses upon fire and large wild creatures, smashing their way through the woods. Max is startled and slightly scared, but also fascinated. He suddenly joins the creatures, roaring and trying to impress them. When he crushes the creatures’ homes though, he nearly gets eaten by them. He is only saved from this fate because he claims he was the king of the vikings for 20 years and that he has magical powers that can solve all of their problems. The creatures are so amazed by Max’s abilities that they make him their new king. He rules proudly despite his differences and some of the creature’s doubts in him. Max becomes quick friends with Carol in particular (Gandolfini) who has confidence, pride, and affection for Max. Max also becomes close to Carol’s crush, KW (Ambrose), who Max convinces to stay with them when Carol feared they had lost her forever. Carol had dreams of building a momentous land of their own, but never really believed this was a possibility. Max insists that they can do this though, starting with a fort. He claims that it will be a place where only good things can happen and only people they want will be able to enter or their brains will be destroyed. After working on it together day after the day, they built a large fort where they can all huddle together. When Carol is feeling jealous of KW’s new owl buddies, Max starts a war where they throw dirt clots at each other. Day in and out they run and play and are each other’s comfort when the day is gone. As more of the creatures doubt Max’s abilities and honesty this perfect place begins to fall apart. He realizes that things aren’t perfect among this family just as his isn’t, but he still belongs with his own kind. Max Records did an incredible job as Max, the king of the wild things. A big part of it was simply because he acted like a kid. He brought out the rebelling and obnoxious side, the lonely and caring side, and the playful and inventive side; especially when it went to the nonsensical tone that many young kids hold in their language. In the scenes where he was trying to act on his inner wild thing, his growls and attempted toughness were absolutely adorable. His portrayal of the character gets to your emotions through the end and is entertaining along the way. Although it was a smaller role, Catherine Keener did very well as Max’s preoccupied, but very loving mother. James Gandolfini did a wonderful job as Carol with his low booming voice, showing the potential for power and aggression, but overall being a much more soothing and compassionate voice. Lauren Ambrose brought forward a calming and resonant voice that contrasted off of Gandolfini’s very nicely as their characters had a complicated, but close relationship. They were portrayed as the other halves of each other, guiding and comforting Max in their own ways. Paul Dano offered the slightly squeakier and shrill voice of the bird-like creature of the group. Catherine O’Hara and Forest Whitaker also had lower voices, O’Hara’s more sharper and intimidating and Whitaker more soulful and emotional. I am really glad they decided to make this in live action rather than animation. In doing so, it brought an entirely new life to the film and made it seem all the more real. The creatures themselves look fierce and monstrous with a naturalistic touch to them. They almost blend in to their surroundings of the woods; their wild domain. At the same time there’s a misunderstood, kind, and gentle characteristic to them in some of the softer features that contrast the rougher ones. The cinematography is absolutely beautiful. There are many bright, sunny shots where the sun is beaming on Max’s new world and all that it encompasses. The texture of the earthy tones both through the atmosphere and the creatures, and even Max as he dirtily wears the earth on him, are well defined. The soundtrack really compliments the movie wonderfully. It allows for the action and escapades we see Max and the wild things explore. Through it the film is able to show the sheer joyful moments and simplicities as well as bringing a youthful and carefree spirit to the table. The dialogue is excellent as well. I laughed through majority of the film, far more than I expected to. It’s very unique comedy and the rarity and richness of it makes it all the more enjoyable and fresh. Most of it is through how closely it resembles the average young child with a rearing mind would in fact talk. Kids can really say the funniest things, exploring this is far more genuinely funny than simply placing jokes in the film. There’s a very natural comedy that shows exaggerated, overstated, and silly absurdities in how our young character sees both his world and even more so the exciting new world of the wild things. Where the Wild Things Are resembles very well what it is to be a kid. It shows the loneliness and longings, angry outburst for craving of attention, the pure joy that can be found in simple things like dirt clot wars, using ones imagination to get out of sticky situations, and the essential need to be loved and truly belong in a place you can call home. It doesn’t just focus on the fun and exploration had, but all of the ups and downs, confusions and joys. This is really spoken in a child’s language more than most films with children as main characters do. Still so much of what Max encounters is highly representative of what adults go through too, just showing it through actions and adventures rather than the lone internal mind. Through this it hits all audiences and more importantly feels like a more honest film. Where the Wild Things Are is one of the truest Children’s book adaptations and one of the best and emotionally riveting films of the year, bringing such a range of emotion, combining sadness and adventure with fantastical elements that are balanced by a very natural, honest tone.